This pattern proposes a method to create a communications channel that allows clients who speak different languages to seamlessly communicate with each other. This channel can be particularly useful in meeting rooms and conference calls where the participants are located in different countries. Translated subtitles, or audio, can be generated and delivered in real time. Have you ever wished there was a way for online game teammates who speak different languages to communicate effectively? Or how about in chat rooms with many clients, such as a Slack, Sametime, or Zoom chat group? Live broadcasts like on YouTube or Twitch? Or maybe online classes and webinars? This pattern proposes a way to do just that: create a communications channel to allow different-language clients to seamlessly communicate with each other. This pattern leverages the MQTT messaging protocol, which allows for each client to publish and “subscribe” to one or more channels. The channel makeup determines each client’s requested language and payload type, (fromClient/french/audio, for example). The channel that each submitted message is sent to determines the sequence of cloud functions that will be called – for example, submitting a message to fromClient/english/audio will run the audio payload through the Watson® Speech to Text service, forward that result to the translator service, and distribute the translated result to all listening clients. Message received from a client, which can be a web browser, CLI, IBM Cloud Function action, SMS text, etc. If message is sent via SMS, sender phone number is added to an etcd key-value store. etcd is used here to maintain a list of subscribers’ phone numbers, as well as their respective languages. An adjustable TTL value is used here to remove numbers from the store if the subscriber does not participate in the conversation for 300 seconds. Watson Text to Speech Demo The service understands text and natural language to generate synthesized audio output complete with appropriate cadence and intonation. The duality between serverless functions and APIs (Medium blog post) Blog post discusses the duality between serverless functions and APIs. IBM Knowledge Center: MQTT Get an introduction to MQTT. Explore MQTT and the Internet of Things service This tutorial covers how to develop device-side and application-side programs using IBM Watson IoT Platform client libraries for Java technology. Introducing Serverless Composition for IBM Cloud Functions (IBM Cloud Blog) Get an introduction to serverless composition for IBM Cloud Functions. 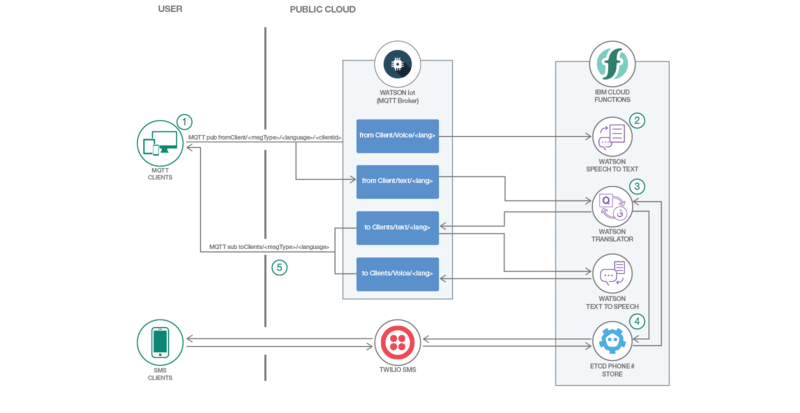 Using IBM Cloud Functions to create serverless microservices (Codeship blog post) This blog post discusses why IBM Cloud Functions might be the best solution for your tech stack.